Omega's high accuracy piezoresistive pressure transducers have a proven record in high performance commercial and aerospace applications for over 25 years. The piezoresistive process uses strain gages molecularly embedded into a highly stable silicon wafer. The silicon wafer is diced into individual die which each contain a full strain gage bridge. The die is mounted in a sealed chamber protected from the environment by glass to metal seals and a stainless steel diaphragm. A small volume of silicone oil transfers the pressure from the diaphragm to the strain bridge. 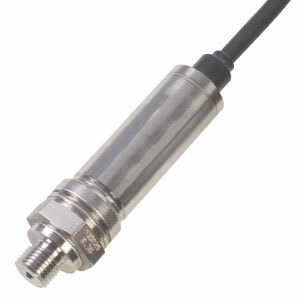 The construction provides a very rugged transducer with exceptional accuracy, stability and thermal effects. A unique design ruggedizes the transducers by providing secondary fluid containment in the event of a diaphragm rupture. At our state-of-the-art facilities, automated test equipment performs pressure and temperature cycling on 100% of the PX409 transducers. The transducers are then calibrated using extremely high accuracy equipment and a 5-point NIST traceable calibration certificate is included with each transducer. The inherent stability of the piezoresistive core provides excellent long term stability, repeatability and very low thermal effects at the price of much lower performance transducers. Standard features of the PX409 Series also include protective features built into the electronics and the pressure element. Reverse polarity, EMC, and power supply fluctuation protection are standard on all models. For Intrinsically Safe and CSA ratings see model PXM509. The most popular ranges and configurations are stocked for immediate delivery. All others typically have very short lead-time. The PXM409 is also available in standard/imperial configurations, with NPT ports, and models from 0-10 inH2O to 0-5,000 psi pressure ranges. Please see the PX409 for complete details, or contact our Pressure department for more information.. The table below features models with 10 mV/V ratiometric outputs. To order 4-20 mA output change the suffix "V" to an "I"
To order 0-10 Vdc output change the suffix "V" to an "10V"
Or see the Part Number Builder below the table to order all models. Note: All models come with a NIST traceable calibraton certificate.